Hello again, I've talked before about finding Stampin' Up because I went to a Coffee and Cards group in my nearest local town. Well, due to recent work commitments I haven't been able to join everyone recently. Luckily I was available to go last Tuesday. It's being held in a new venue and I'm so pleased the lighting is better. It was lovely to see some familiar faces and catch up with the news as well as meet what I hope will become new friends. 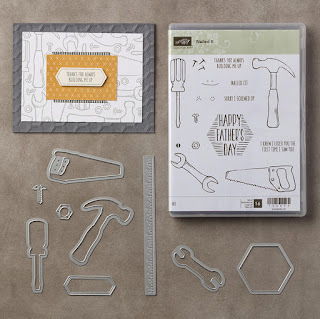 Susan had been asked if she could design some cards that were suitable for men; they never seem to be an easy subject to cater for but the new bundle Nailed It fits the bill perfectly. We made a smaller notecard size one as well as the usual A6. 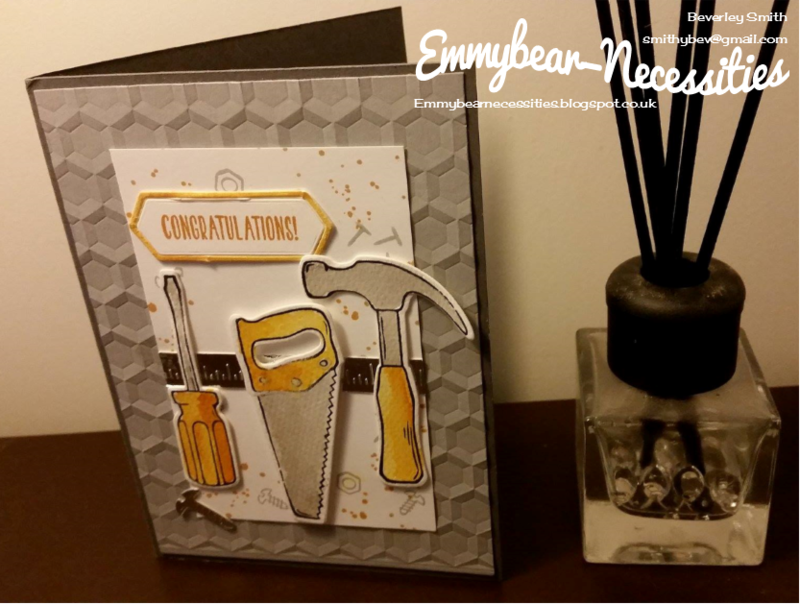 I love the nail die, the ruler is embossed! So often men's cards are very dull colourwise so it made a refreshing change to use Delightful Dijon from the In Colours 2015 - 2017. This colour will be retiring at the end of May so if you haven't got it yet and want it, don't delay. It certainly went into my shopping basket this week; I have all of the ink pads in the colour families but so far have only got the In Colours I know I'll use alot. The first card we made was suitable for a novice to undertake. 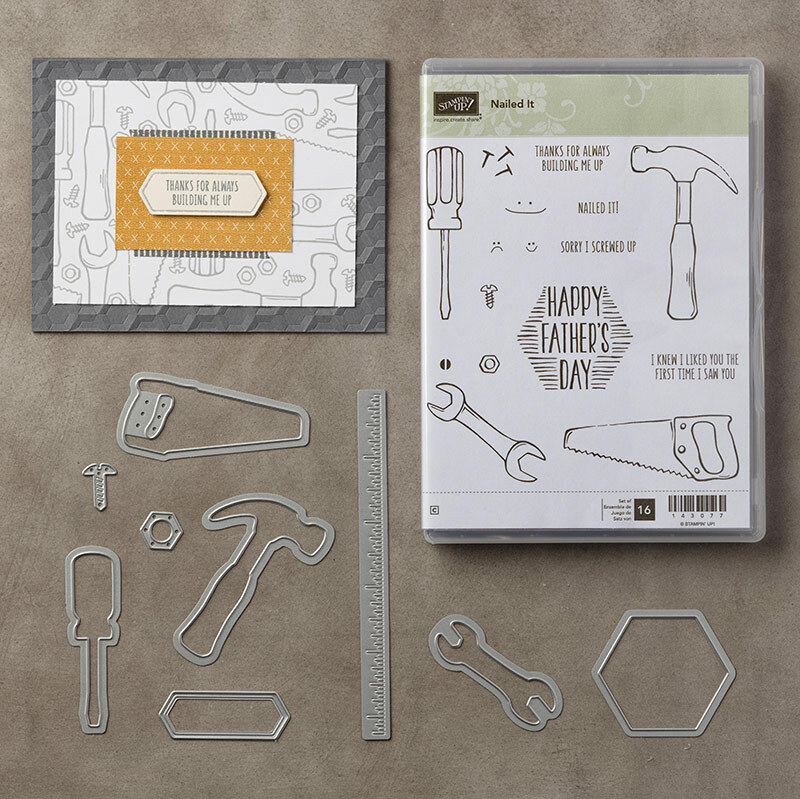 Both Louise and I decided to go a little off piste with the Father's Day stamp which meant slightly altering the placement of the screwdriver. Once home I also decided to stamp the grey background card to add more interest. I love that we all start with the same basic premise and adapt it to suit our requirements. The second card used Gorgeous Grunge to enhance the background. It was a stamp set I had passed by several times but once bought, it makes an appearance in so many cards I make. 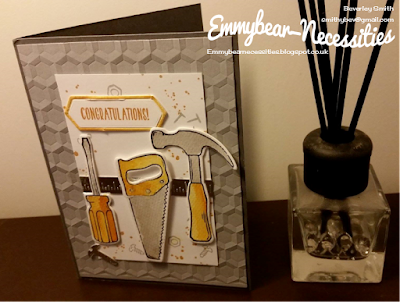 This time, we used the Hexagons Dynamic Textured Impressions Embossing Folder. It gives amazing depth to any project it's used on. At the moment if you buy the stamp set and coordinating dies as a bundle you can save 10% on the retail price.